Bass fishing on the local reservoirs is going full steam, particularly at Lower Otay and El Capitan. 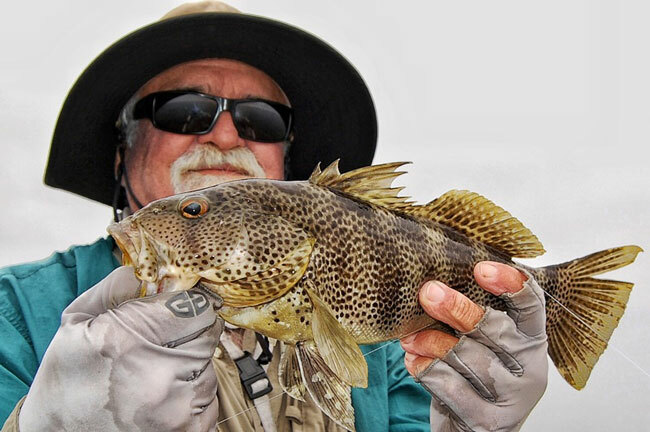 Diamond Valley, just north of San Diego is absolutely on fire – fishing as good as it has in years! The upcoming full moon and warm weather should kick things into an even higher gear for bass anglers this upcoming week. SDFish member ‘Brandon Mori’ caught this big angel shark in San Diego Bay while bass fishing. NFL Receiver Design Jackson, middle, displays some big Diamond Valley largemouth bass he caught recently. 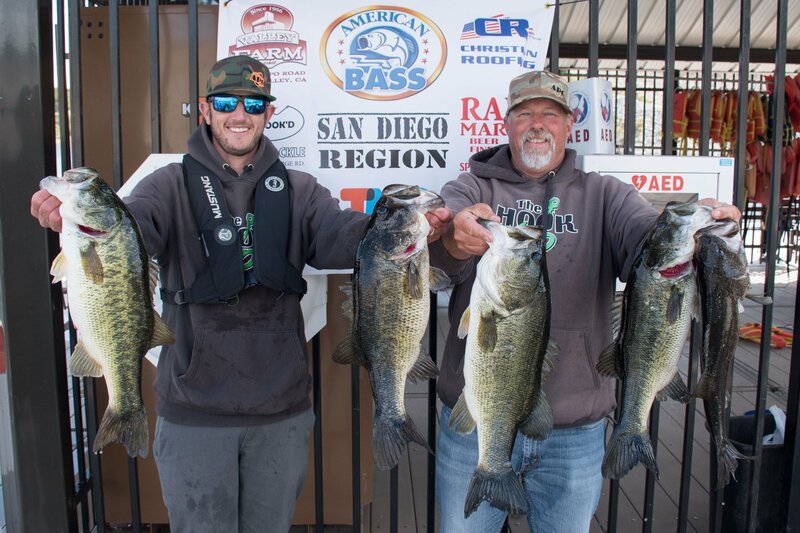 Wade Strelic and Rusty Salewske display their winning limit in the American Bass Association Tournament at San Vicente on March 24th. Anglers Marine’s Rick Grover with a pair of big Diamond Valley prespawn largemouth bass! Wade Strelic with a giant 50+ pound blue catfish caught on March 18th at El Capitan while bass fishing. Barrett Lake: Currently closed. Scheduled to reopen for the 2018 fishing season on May 2nd. Reservations for the month of May will go on sale on Tuesday, April 10th at 7 PM. Lake Cuyamaca: Cuyamaca received 1,200 pounds of rainbow trout from Jess Ranch on March 13th, 1,500 pounds from Wrights Rainbows on the 29th and a small plant from the California Department of Fish and Wildlife (CDFW) at some point last week. ‘Maca is open daily from 6 am to 4 pm. Chollas Lake: Open to kids only (15 and under). The CDFW has made a few small trout plants at Chollas Lake this year, most recently the week of March 18th. Though the CDFW does not divulge the amount of trout stocked, they typically put 125-200 pounds of rainbows per stock – about 250-400 fish averaging 1/2 pound in weight. Open daily 6:30 am – 30 minutes before sunset. Anglers Marine’s Rick Grover with a pair of big Diamond Valley pre-spawn largemouth bass! Diamond Valley Lake: Bass fishing at Diamond Valley is about as good as it gets for quality fish. Anglers Marine owner Rick Grover and West Coast bass legend Don Iovino partnered up to land a 5 bass limit weighing over 34 pounds! NFL Wide Receiver Design Jackson took of the Tampa Bay Buccaneers came out for a trip on DVL and also got on the big pre-spawn bass! 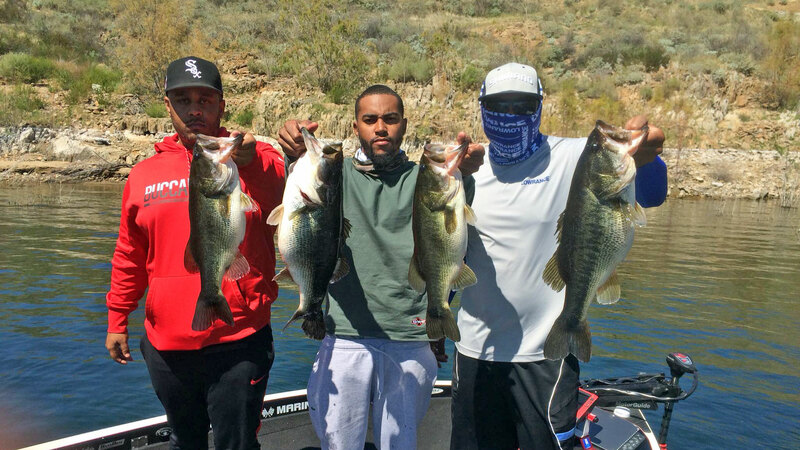 Without question, the best bass bite in Southern California is occurring at Diamond Valley right now – even despite how good El Capitan and Lower Otay are. DVL received 3,500 pounds of rainbow trout on March 13th and have another plant scheduled for April 11th. Diamond Valley is open Wednesday to Sunday from sunrise to an hour before sunset. Dixon Lake: Dixon received trout on March 21st and 28th, both 1,500 pounds from Calaveras Trout Farm, so there are plenty of stocker trout available for anglers right now. Remember that trout are mandatory catch and keep, no releasing trout allowed. Bass are now spawning, and some giants have been spotted on beds already. Water visibility is about 25′, so be prepared for clear water conditions. The water temperature has been in the low 60s. No state fishing license is required to fish at Dixon, and the lake is open daily 6 am to 5:30 pm. Doane Pond: This small pond in the Palomar Mountain State Park is yet to receive any trout plants this season as its still exceptionally cold up there. Trout are typically stocked by the CDFW late April through June at Doane and average about 150 pounds per stock, 1/2 pound average fish. There is no point to fishing up there until the trout stocks resume. 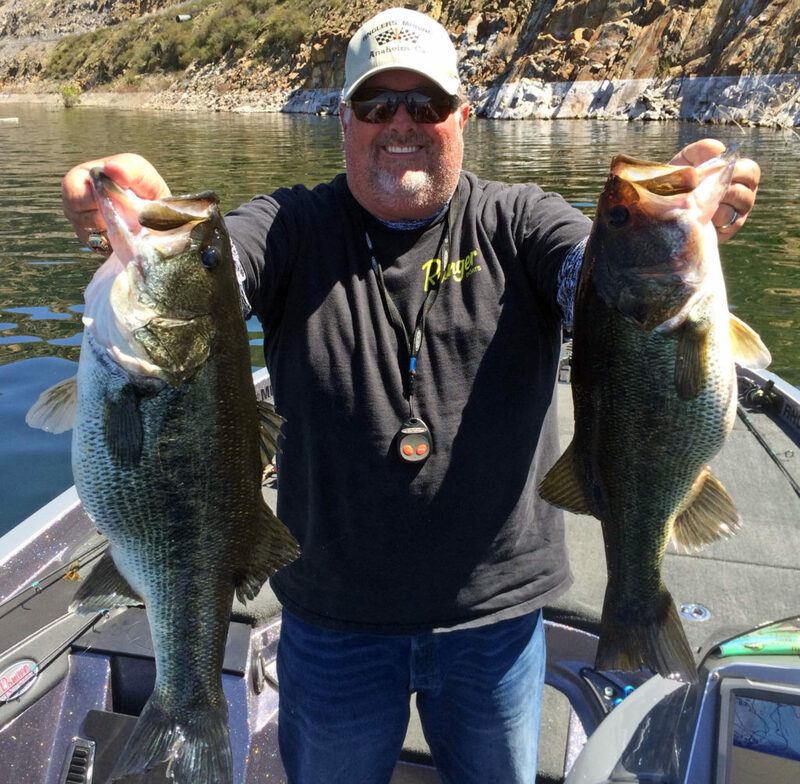 El Capitan Reservoir: Bass fishing at El Capitan has been tremendous! Lots of presentations are working, including reaction baits like spinnerbaits and chatterbaits to the standard jigs and plastics. Bluegill and crappie are showing up in reports as well. 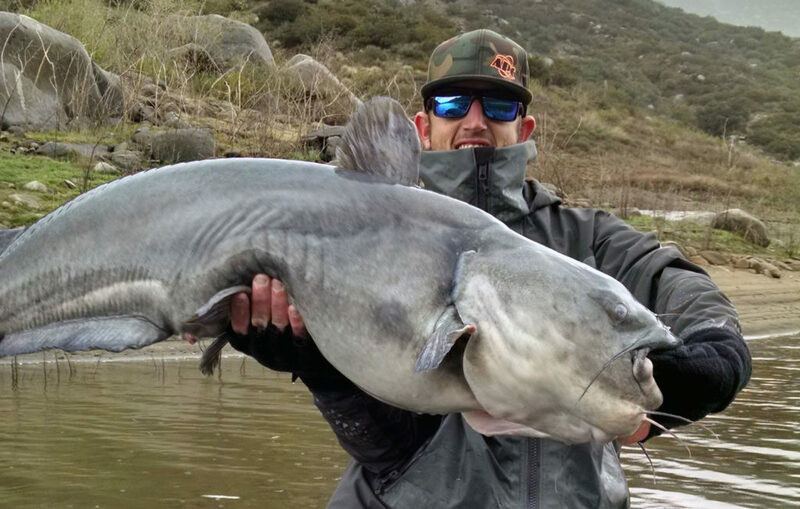 The blue catfish fishery at El Cap seems to have taken off! Wade Strelic caught what was likely a lake record sized fish on March 18th while fishing a bass tournament (which he won with father Jon Strelic). The lake record was just broken earlier this month, and I’d be surprised if it’s not broken again this year. El Capitan is open on its winter schedule; open for fishing Friday through Tuesday from a half hour before sunrise to a half hour before sunset. The water temperature is in the mid-60s, and the boat launching conditions are good despite the lake level dropping. It’s down about 2 vertical feet since the start of the month. Guajome Park: No recent reports from Guajome Park. But the ponds are open for shore fishing from 9:30 am to sunset each day. Parking is $3. 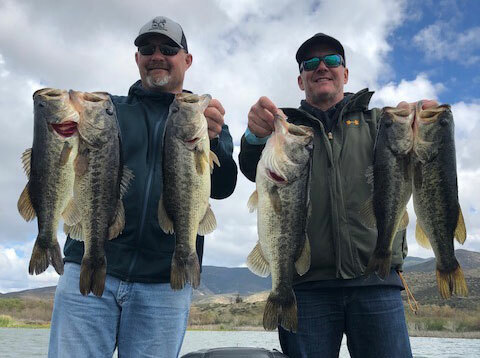 Lake Henshaw: No recent reports from Henshaw, but this time of year is traditionally pretty good for crappie, and April is traditionally probably the best month of the year for shallow water fishing at Henshaw. The CDFW has been making a concerted effort to improve fishing at Henshaw the last couple years by adding a lot of fish habitat. Once a very popular destination for bass anglers, Henshaw is now mostly known for its carp population – which local fly anglers and bow fishermen appreciate. The lake is open daily for fishing. 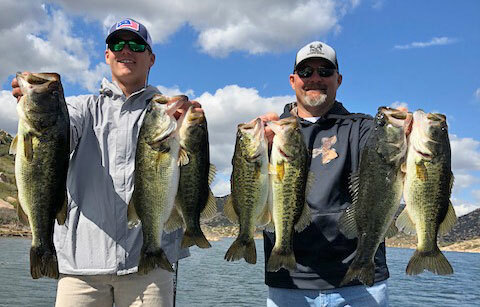 Lake Hodges: Hodges has been considerably better this year than the last couple, though most weekend warrior bass anglers will find the lake challenging still. There is no question though that the quality of bass at Hodges is exceptional, with plenty of 4-6 pound bass around. Crappie are holding on vertical wood structure in about 10′ of water. Hodges is open on a Wednesday, Saturday and Sunday schedule through October. The concession stand opened on March 7th – so rental boats are now available. Boat launching is good using their secondary ramp. Lake Jennings: The CDFW dropped off some trout this week, and Jennings also planted 1,700 pounds from Wrights Rainbows last week. Bass have been spawning for a few weeks now and with the full moon on the 31st, we are probably right in the middle of the peak spawning period for largemouth bass at low elevation lakes in the county like Jennings. Jennings is currently open daily from March 23rd to April 8th for Spring Break. Lindo Lake: Lakeside’s urban pond Lindo Lake received their only trout plant of the season so far the week of December 17th. Truthfully, don’t expect much at Lindo in terms of fishing outside of trout plants, but there are bass, catfish, carp, and bluegill in Lindo – and every now and again some kid catches a pretty nice bass and reminds us they’re there. Lindo Lake is open daily from sunrise to sunset. Loveland Reservoir: Like most lakes in the county, bass are either staging to spawn, or actually spawning right now where they can be especially vulnerable to shoreline anglers. Since Loveland does not allow any boating or float tubing, it’s essential that bass be shallow in order to have much success there. Jigs and plastics are usually the way to go at Loveland in the early Spring. Loveland is open daily (closed on major holidays), currently from 6 am to 5 pm. Lower Otay is open on a Wednesday, Saturday and Sunday schedule for shore fishing, float tubes/kayaks, rental boats and private boats. Lake Miramar: Despite other lakes receiving trout, and scheduled to receive more trout from the CDFW, Miramar continues to be shunned by the CDFW. No trout have been planted this season. The full moon this weekend will draw a lot of bass up shallow to spawn. The launch ramp is currently out of water, and the lake is open for fishing and private boats, kayaks and float tubes daily one-half hour before sunrise to sunset. Gates open at 5:30 am. Call 858-527-1722 for concession hours if you’re interested in rental boats. Lake Morena: Unlike the low elevation lakes in San Diego, Morena won’t have a huge wave of fish hit the shallows during the full moon period this weekend. The next full moon will likely be the one for Morena and Cuyamaca. Pre-spawn tactics will be key for the next few weeks at least, and swimbaits can still produce for anglers looking for a trophy bite as the big female bass start fattening up for the spawn. Lake Morena has received fewer trout stocks than usual this Winter due to the CDFW’s hatchery shortage (from a fish kill). They last received CDFW trout the week of December 17th – but received 1,000 pounds from Jess Ranch the weeks of February 5th and March 12th. Morena receivers very little fishing pressure due, so there should be a good amount of trout left and the conditions are good with the water temperature approaching 60 degrees. Boat launching is available and the lake is open daily from 6 am to 4:30 pm – rental boats also available. Lake Murray: Murray received a small load of CDFW rainbow trout the week of March 18th. You can bet the big bass took notice. The full moon this weekend will pull a bunch of bass back up on the spawning beds, and perfect weather forecasted will keep them there. This lake will kick out some giant bass the next couple weeks. Murray is open daily, and the boat ramp is reliably operational. Lake Poway: Poway received 1,500 pounds of rainbow trout from Chaulk Mound on March 21st, including some trophy-sized fish. They’re scheduled to receive two more plants this season; April 4th and 18th. Bass are spawning, and several fish over 11 pounds have been pulled out of there including a 16.1 pounder. Poway is open Wednesday through Sunday from 6 am to sunset. They are hosting a trout fishing seminar on April 8th, led by angler Scott Cochran and the Lake Poway Park Ranger. Lake Ramona: This little hike-in only lake is open daily for shore fishing (no boats, tubes, or any type of vessel or water contact permitted). Bass fishing is good up there right now. Check out SDFish member Jebus’ report from this week. Long casts and a stealth approach are paramount to any sort of real success up there as the water is ultra clear. Pack plenty of water for the long and grueling walk in from the Blue Sky Reserve parking lot in Poway. No permits are required, but a California State Fishing License is. San Diego River: This is a very productive time to of the year to fish the San Diego River. Bass will typically be active for the next couple months and accessible in the shallow water along the shoreline. The river is, of course, open daily, no permits required, but you need a California State Fishing License. Be careful of your surroundings, the riverbed is littered with vagrants and trash. San Vicente Reservoir: Guide Jim Hallauer (jimhallauerfishing.com) reports that the best quality bass at San Vicente remain in 10-20 feet of water, though an abundance of smaller bass are all over the bank. He and his clients are catching the better fish using finesse presentations as the primary tactic. Concessionaire Rocky Mountain Recreation reports that anglers are catching double-digit numbers of bass on senkos, Texas rigs, small swimbaits, and flukes. The warm weather should pull the panfish back into the equation. San Vee is open for fishing Thursday through Monday, launching conditions are good. For boat rental availability, call the concessionaire at 619-390-1918. Santee Lakes: Opening weekend for their catfish season is April 7th and 8th. 2,000 pounds of catfish will be stocked in lakes 3 and 4 for the opening weekend, including tagged fish worth prizes. Trout are still being caught and reported, despite the last stock coming on March 7th. Bass are spawning and a couple of nice largemouth were reported there recently including a 9.3 pounder for Charlie Grawey from Lake 5, caught on a swimjig. Bass are catch and release only at Santee Lakes. Park hours are 8 am to 7 pm Monday – Thursday and 6 am to 7 pm Friday – Sunday. Lake Skinner: The water temperature is a low 52 degrees up at Skinner, and the water level is also very low. Trout were last stocked on March 14th and 28th. Stripers are showing around the inlet/dam area on cut baits. Bluegill are coming on mealworms and nightcrawlers all around the lake’s points. Skinner is open daily from 6 am to 10 pm, with the marina closing at 5 pm. For more information, contact the marina at (951)926-8515. Lake Sutherland: The bass fishing at Sutherland is heating up a bit. We even had some pretty promising reports posted on our forums lately, including member ‘RamonaAngler’ getting several nice fish in shallow water. Sutherland is open on a Friday, Saturday and Sunday schedule. The launch ramp will again be serviceable this season it appears, but boat launching is only permitted on Saturdays and Sundays and requires an inspection for quaggas. Sweetwater Reservoir: Sweetwater is open for shore fishing only on a very limited 2.5 mile stretch of shoreline. Permits are $5 (cash only) and a California Sport Fishing License is required as well. No boats, float tubes, or kayaks permitted. Open for fishing Saturday – Monday from 7 am to 4 pm. Closed on major holidays. No live bait allowed, except for worms and crickets. Upper Otay Lake: Upper Otay continues to not garner much attention from bass anglers as it chugs along without fanfare following a presumed fish kill several years ago. Still, this is the time of year when the fishing could be good, and some anglers reported signs of optimism the last few months. Open for shore fishing and float tubing only on a Wednesday, Saturday and Sunday schedule. Permits can be purchased from an iron ranger pay station. Catch and release only, no bait, barbless artificials only. Wade Strelic and Rusty Salewske won the American Bass Association Tournament at San Vicente on March 24th (9 teams). They had 24 pounds even for their top-5, including the big bass of the tournament at 6-pounds 13-ounces. Anglers Marine is back in San Diego next weekend with their El Capitan tournament on April 7th. These tournaments pay back 100%, visit anglersmarine.com for more information on how to enter! The San Diego Team Series will host a tournament on April 7th as well, at San Vicente. And the California Bass Federation is at Hodges on April 8th. The CDFW Trout Truck was finally back in San Diego recently! They planted Murray, Cuyamaca and Chollas the week of March 18th, and Skinner and Jennings this week. Planting trout this week: Skinner, Jennings, Dixon, and Cuyamaca. Planting trout next week: Jennings and Poway. Santee Lakes will be planting catfish for their upcoming Catfish Season Opener on April 7th and 8th! 2,000 pounds of catfish will be planted in lakes 3 and 4 for the weekend. For a schedule of all fish plants taking place in San Diego County, check out our Fish Stocking Schedule. Fishing in San Diego Bay and Mission Bay is still very good! Spotted bay bass, halibut, corvina and lots of sharks and rays have been reported recently. The halibut fishing lately has been particularly good! The city of San Diego is currently dredging several areas of Mission Bay to create a more uniform bottom contour for boat navigation. This may disrupt some good areas of that bay for the next few months. SDFish member ‘fishboy92’ found some really good fishing for corvina on artificials. 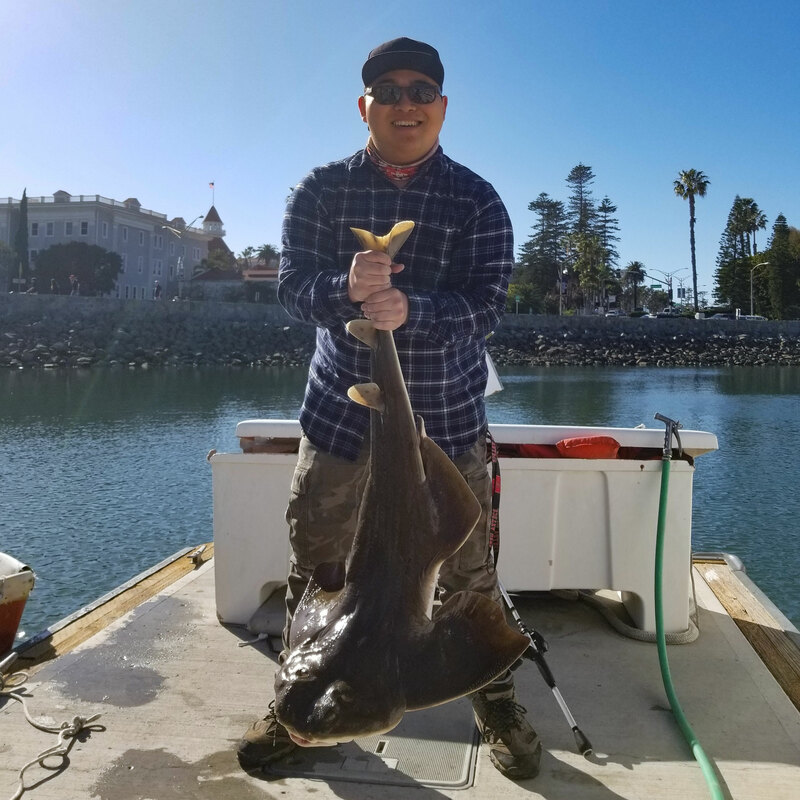 Member ‘Brandon Mori’ made quite the incidental catch while bass fishing in San Diego Bay when he connected with this big angel shark. ‘Kam_Walsh98’ and his dad got the tubes out and hit the harbors and got into some nice spotted bay bass and smaller halibut. We are reprinting our popular “San Diego Skyline” series of SDFish shirts, and a spotted bay bass themed shirt is available for order now. Shirt orders support sdfish.com and the continued efforts of content items like this fish report. The stable weather has improved surf fishing, and anglers are having success for halibut, surf perch, corbina, and rays right now from the county’s beaches. SDFish’r ‘romalley’ even scored an angel shark from the surf this week!! The upcoming full moon will kickoff another 4-night cycle of predicted grunion runs starting this Saturday, March 31st at 10:00 pm. The observation only season starts in April, so you’ll only be permitted to collect grunion until midnight on March 31st. Typically the 2nd hour of the two-hour window is best, and the 2nd and 3rd nights of the 4-night cycle are usually the most active. Check out our recent article on the 2018 grunion season, and how to fish them. Follow along with our surf fishing forum for all of the intel. There are some good tidal swings coming up the next few days that should present some good surf and bay fishing opportunities. The weather continues to muffle sportfishing trips out of San Diego. The California rockfish season opened today, so look for a lot of focus on that fishery from the local fleet. 1/2 Days: Good fishing for rockfish for the 1/2 day fleet. Vermillion, sculpin, whitefish, bonito, mackerel and even some sand bass showing in the counts as well. Crowds were light through Tuesday when some big numbers encouraged anglers to get out the last half of the week. The weather should be really calm this weekend, so fishing conditions will be favorable. 3/4 Days: Not really much in the way of 3/4 day trips to report on this week. The Fisherman III out of H&M had 10 anglers aboard a 3/4 day on Saturday, March 24th and put them on 35 whitefish, 63 rockfish, 1 sheephead and 1 bonito. Full Day: The San Diego out of Seaforth posted 13 yellowtail, 75 rockfish and 2 bonito for 20 anglers on their trip Thursday, March 29th. They had 58 yellowtail, 60 rockfish and 1 bonito on Wednesday for 25 anglers, and recorded 49 yellowtail, 40 rockfish, 1 bonito and 60 vermillion rockfish for 15 anglers on Tuesday. The Liberty out of Fisherman’s Landing had 22 anglers aboard yesterday, March 29th and got 25 yellowtail and 5 bonito. TODAY…Wind W to 10 kt. Gusts to 15 kt in the afternoon. Wind waves 2 ft or less. Swell W 1 ft at 10 seconds. Areas of fog in the morning, then patchy fog in the afternoon. VSBY 1 NM or less. TONIGHT…Wind variable less than 10 kt. Wind waves 2 ft or less. Swell W 1 ft at 9 seconds. Patchy fog in the evening, then areas of fog after midnight. VSBY 1 NM or less. SAT…Wind variable less than 10 kt…becoming W 10 kt in the afternoon. Wind waves 2 ft or less. Swell W 1 ft at 9 seconds. Areas of fog with VSBY 1 NM or less in the morning. SAT NIGHT…Wind SW to 10 kt in the evening… becoming variable less than 10 kt. Wind waves 2 ft or less. Swell W 1 ft at 9 seconds. SUN…Wind variable less than 10 kt…becoming SW 10 kt in the afternoon. Wind waves 2 ft or less. Swell W 1 ft at 9 seconds. SUN NIGHT…Wind S 10 kt with gusts to 15 kt. Wind waves 2 ft or less. Swell W 1 to 2 ft.
MON…Wind S 10 kt with gusts to 15 kt. Wind waves 2 ft or less. Swell W 2 ft.
MON NIGHT…Wind W 10 kt with gusts to 15 kt in the evening… becoming variable less than 10 kt. Wind waves 2 ft or less. Swell W 2 to 4 ft.
TUE…Wind S 10 kt. Gusts to 15 kt in the afternoon. Wind waves 2 ft or less. Swell W 3 to 4 ft.
TUE NIGHT…Wind variable less than 10 kt. Wind waves 2 ft or less. Mixed swell W 2 to 3 ft and S 3 ft.
Don’t forget to check out our message board for thousands of detailed fishing reports from anglers like you!